While it’s a little too intricate for a “last minute” Mother’s day present, if you get started now, you’ll have it done in time! Mum can be a little hard to shop for at times, but this fretwork heart will last longer than flowers, a card, or chocolates. She is sure to love it. While you can use almost any wood for this, I suggest a colorful hardwood for the fretwork and a stained or painted plywood for the backing board. While the cutting may take a while, this project is simple to assemble. After you attach the pattern to the blank, drill blade-entry holes, and cut the frets. If you plan to add a backing board, turn the stack over, attach the backing board pattern to the bottom of the stack, and cut the perimeter. Then, remove the backing board, flip the stack, and cut the intricate perimeter of the fretwork heart. Sand the cut pieces and apply a finish of your choice. Use cyanoacrylate (CA) glue or epoxy to secure the heart to the backing board and to attach a hanger to the back. 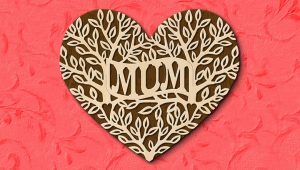 For a “Mom” fretwork heart pattern, as well as a few other variations, see Scroll Saw Woodworking & Crafts Spring 2017 (Issue 66). For more articles available in Scroll Saw Woodworking & Crafts Spring 2017 (Issue 66), CLICK HERE. Click here to download the “Mum” fretwork heart pattern.